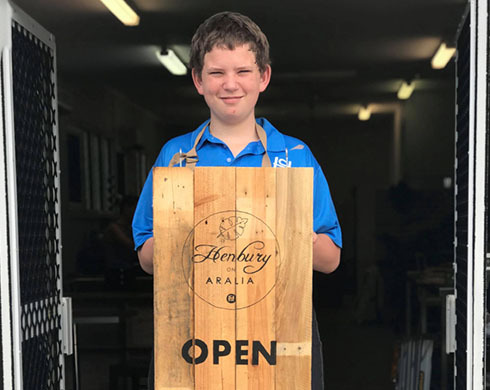 In a move to further boost the transition to work skills of Henbury School students, a new training site has been developed on Aralia Street in Nightcliff. The new café, garden and gift shop, external to the school for students with special needs, joins the school’s Opportunity Knocks Op Shop. Assistant Principal Lauren Hofmeyer said students will become proficient in skills different to those developed at the Op Shop. “Like the Op Shop, students will have the opportunity to develop retail skills, but they will also receive training in horticulture, hospitality and construction,” she said. “Some students have been involved in fitting out the space, revitalising old furniture, painting, and building a customised bench front from which coffee will be served. Ms Hofmeyer said the café and garden—nine months in the making—will provide students with excellent real world experiences, and be a compelling addition to their resumes. “This space, which will be run by up to eight supervised senior years’ students, will also create several self-sustaining enterprises by selling wares from our middle years’ Skill Set Programs,” she said. The precinct opens on Friday 5 April 2019. The hours of operation will be 10am to 2pm on Thursday and Friday, and 9am to 1pm on Saturday.